The Intelligent Pump can handle aggressive, corrosive fluids, making it effective for high-pressure cleaning. Image: Shutterstock. Wanner International recently announced the launch of its Hydra-Cell Intelligent Pump (patent pending), designed for lower total cost of ownership by reducing maintenance and service costs by up to 80% over its lifespan. The company says the Intelligent Pump is an energy-efficient, high-pressure cleaning pump with ultimate controllability, which could save up to 13,500KWH in energy per year. 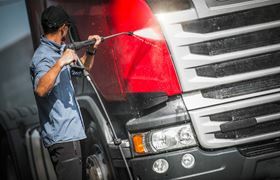 One of its principal applications will be in truck cleaning in the construction industry. It operates without any dynamic seals and supports a ‘plug and play’ fixed solution that makes it easy to install. Its seal-less design handles recycled/ grey water, high liquid temperatures of up to 120°C and works without forced lubrication. The Intelligent Pump can also handle aggressive, corrosive and large-particle fluids such as sodium hydroxide, acids and citrus based solvents, making it effective for high-pressure cleaning. The pump’s seal-less design prevents leaks, ensuring that these harmful substances remain inside the pump, rather than creating health and safety risks through leakage, a common problem with plunger pumps. The Intelligent Pump works effectively because it is designed to use multiple lances with one pump without the need for liquid bypass, eliminating the need for unloader valves or pressure regulating valves.